Hickison Benchmark is a sagebrush covered knoll located at the northern end of the Toquima Range of central Nevada. It is just off of highway 50, between the towns of Eureka and Austin. There is a 4WD road leading to the summit adorned with communication equipment. The road makes for an easy hike of about 4 miles round trip if you start from the highway. I was making the long drive from Boise to Death Valley, and was looking for a good leg stretcher along the way. After scanning the maps the prior day for options, I found Hickison Benchmark. I pulled off the highway at the start of the 4WD road, just east of the Hickison Petroglyph Recreation Site. After going through a gate, I hiked quickly up the hill to the summit in about 40 minutes. The highpoint provided great views of the various surrounding mountain ranges. This was all new terrain to me, and there were several interesting looking peaks in view. After a short stay, I headed back down the road to the car. Round trip was 4 miles, 900’ elevation gain, in 75 minutes. 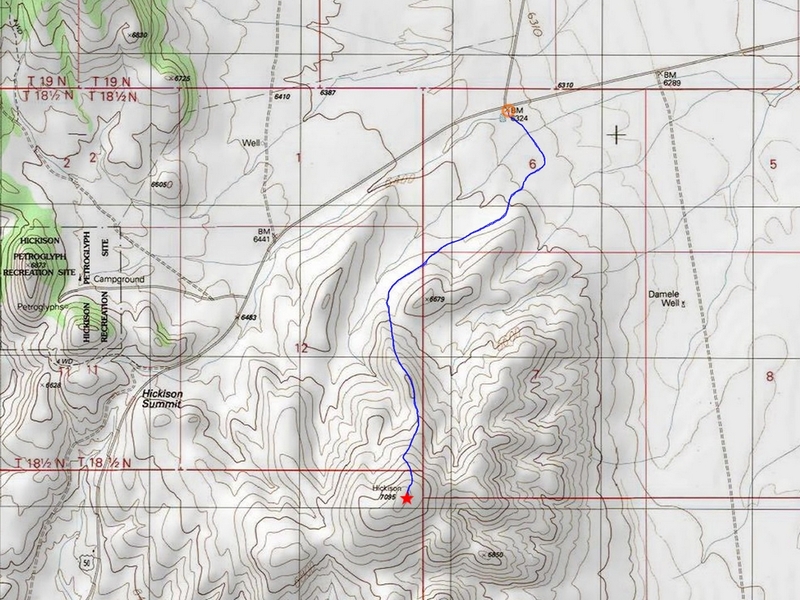 Map of the route, 4 miles and 900' gain round trip. View from start of hike. Map of the route, 4 miles and 900' gain round trip.View from start of hike.Headed up.Summit view east.Communication equipment on top.